Stephen was born on the Rama Reserve near Orillia, Ontario, in 1966. He began to draw as soon as he could hold a pencil and crayon. Stephen was cared for and supported by his mother, Carol, and artist in her own right—who along with her cousin Arthur Shilling recognized and encouraged Stephen to continue his art. Arthur Shilling took Stephen under his wing and helped him refine his young raw talent. 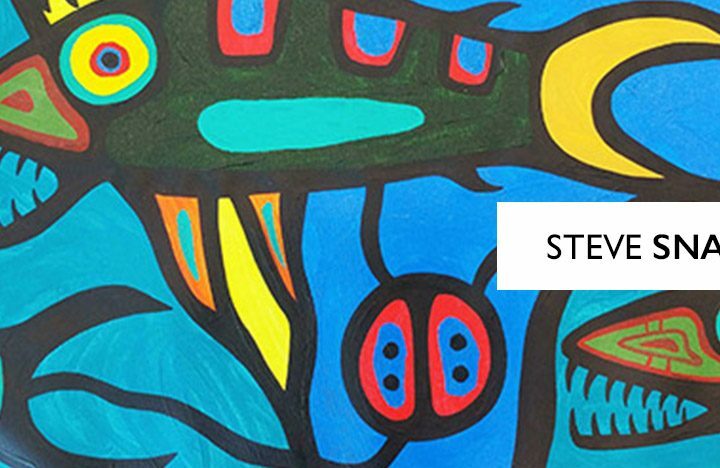 Shilling was the one who first exposed Stephen to the prolific works of Norval Morrisseau. Stephen’s family moved to Midland, Ontario where he continued to draw—but instead of his reserved pictures depicting everyday life, and legends passed down; it was grain elevators, and other similar subjects of everyday rural life. Tragically, Arthur Shilling passed away in 1986 from a heart ailment. Three years later Stephen held his first exhibition at The Woodland Cultural Centre in Brantford, Ontario. In 1994, Stephen settled in the Bear Island Reserve on Lake Temagami. There, Stephen continues to live and paint. His works can be found in the David Bronfman Collection, as well as the Chamber of Commerce in Orillia, and the First Nations of Rama Bank office. His commissioned works include the portrait of Orillia’s mayor, and set design for the Roots and Wings Theatre Co. on Bear Island.